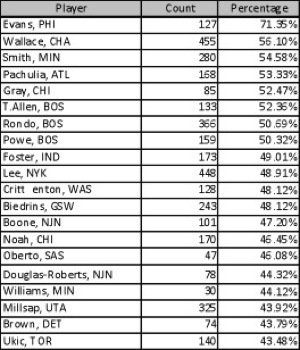 Basketball-Statistics.com » Blog Archive » Easy Buckets: Who Depends on Them the Most? 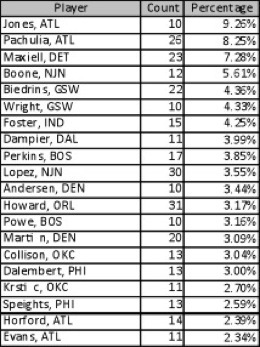 Easy Buckets: Who Depends on Them the Most? Using the play-by-play data available at BasketballValue, you can calculate all sorts of things about a player’s tendencies. One of these is the types of shots a player typically takes. I’ve sorted through the data and now possess a mini “scouting report” on each player’s shooting tendencies. I will use that data to explore a number of different issues in the future. Today I’m going to take a look at easy buckets. There’s a nice mix of big and small guys. Leading the way is Reggie Evans, a bull on the inside who perhaps doesn’t have the height/athleticism to finish with authority. He’s not going to take stupid shots, so unless he’s near the basket, he won’t be shooting. Tony Paker (not shown) leads the league in total layups, but those make up only 39.36% of his attempts. Greg Oden entered the league without a very polished offensive game but with a ton of strength, and it shows. He relies more on dunks to score than other player in the league. This list is full of centers. Besides Gerald Wallace and Renaldo Balkman, every other player on this list is either a power forward or center. The leader in total dunks is Shaquille O’Neal, followed by Dwight Howard (who ranked 21st in terms of percentage). One of the biggest criticisms for Charlotte in their recent trade for Tyson Chandler is Chandler’s limited offensive skills. The belief is that a lot of his scoring comes on easy dunks and alley oops, thanks to Chris Paul. Well, the belief is right. 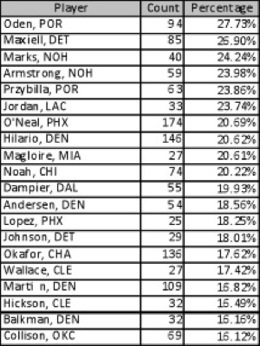 Chandler and DeAndre Jordan are far and away above the rest of the league. A couple of notable alley oopers are also on this list, such as Jamario Moon twice (with Miami and Toronto) and Shawn Marion (with Miami). 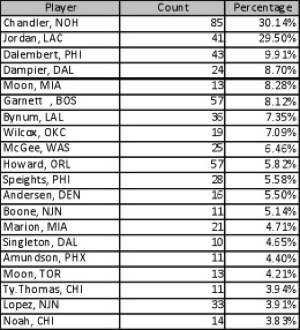 Chandler is the league leader in total alley oops. And LeBron? He recorded 30, but those accounted for just 1.86% of his shot attempts. A lot of the players here aren’t household names, highlighted by Solomon Jones at the top. The Hawks feature four players in the top 20, and that doesn’t include the always spectacular Josh Smith, who just missed the cut. Dwight Howard is the league leader in total putbacks. I imagine most of those are dunks. There are many familiar names here. Chris Andersen, Tyson Chandler, and Joel Przybilla were in a heated race for first (I’m sure they were well aware of this at the time). In the end, Andersen finished as the leader in terms of percentage. 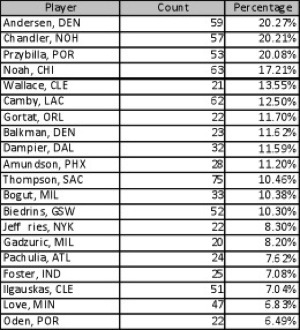 The leader in terms of total tip attempts, though, was Jason Thompson. Pau Gasol was second, although his 64 tips accounted for just 6.19% of his total shot attempts. In conclusion, it’s no surprise that many of the same names appeared on most of these lists. Certain players (usually big men) just have a knack for being near the basket on offense and creating easy attempts. Others also have the benefit of playing with great point guards such as Chris Paul or Chauncey Billups. Either way, these easy buckets are highly efficient and very much appreciated by coaches. Layups, dunks, alley-oops,…… they’re all good for at least 2 points.